Press the “Input Data” button, define a pressure load, and click OK. Select the faces of the Tet element which you want to apply the constant pressure load. To make the picking easier, click the “Toggle visible entities only Selection” icon (see Figure 2). Toggling this on will allow the selection of visible entities and faces. Also, click on the “Solid Faces” filter for picking. 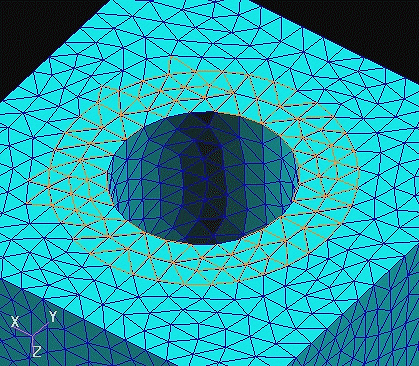 Click the faces on your solid model where pressure load is to be applied (Figure 3). 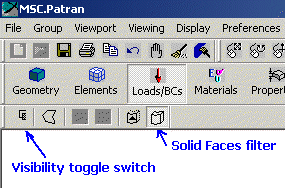 When faces have been picked, there will be a list of faces defined in the “Select Solid Faces” input box on the Load/BCs Form. 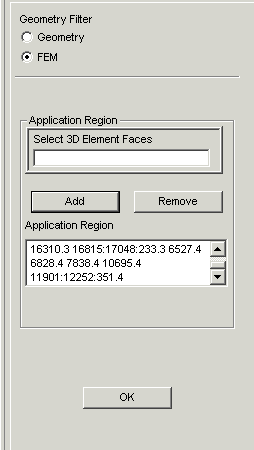 Click “Add” to add these faces to your Application Region (Figure 4). If you made a mistake during your selection, pick that face again and click “Remove” to remove it from your Application Region. Click Apply on the Loads/BCs form and the loads should be applied to the selected faces. That’s it! There are a few other tricks you can use to pick the solid faces, but this basically how you do it.